Perhaps one of the most identifiable landmarks in the State of Missouri or at-least to alumni and fans of the University of Missouri can be found at Faurot Field, the Block M. This symbol of Mizzou, a 90 feet wide by 95 feet high “M” is above the north endzone and was constructed by students in 1927 using leftover rocks from the construction of the stadium. Football has been played at the university since 1890 and at Faurot Field since 1926. In December 1925 construction began on a new stadium for the Tigers in order to accommodate larger crowds. Originally known as Memorial Stadium after university alumni who perished in World War I, the $350,000 was completed when the Tigers played their first game against Tulane on October 2, 1926. 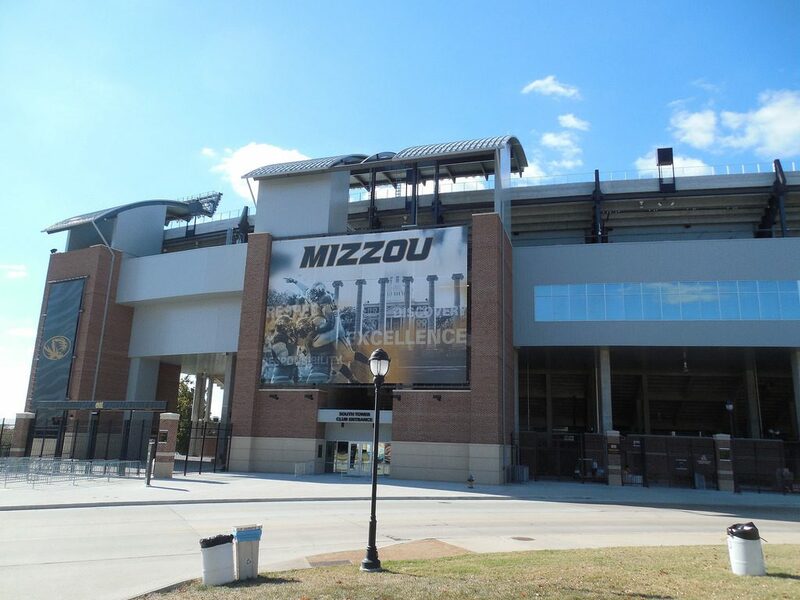 The stadium had an original capacity of 25,000 and was named after former Tiger Coach and Athletic Director Don Faurot. The original 25,000 seat capacity proved to be to small as there were numerous expansions to the stadium including enclosing the facility and adding decks on both sides of the playing field between 1949 and 1965. Prior to the start of the 1968 season, a new press box with VIP lounges was built on the west side of the stadium. In 1972 the stadium was named in honor of legendary coach and athletic director Don Faurot. Later that decade, in 1978, the south endzone was enclosed with 10,800 seats increasing the seating capacity to 62,023.In 1985, the grass field was replaced by artificial turf, however, grass returned a decade later. Lights were added in 1996 allowing night football for the first time at Faurot Field. <align=”left”> A $5 million 30×80 foot HD video board was installed in the north endzone in 2009. The latest expansion project at Faurot Field was completed before the start of the 2014 season. Completed in two phases, the first phase renovated the west tower before the stadium of the 2013 season and shifted the Rock M closer to the field allowing the north concourse to be expanded. On the east side a new tower containing 1,200 premium seats and a 4,100 seat upper deck was constructed before the 2014 season increasing the seating capacity to 77,000. Concourses, restrooms and concession areas were also expanded and upgraded. 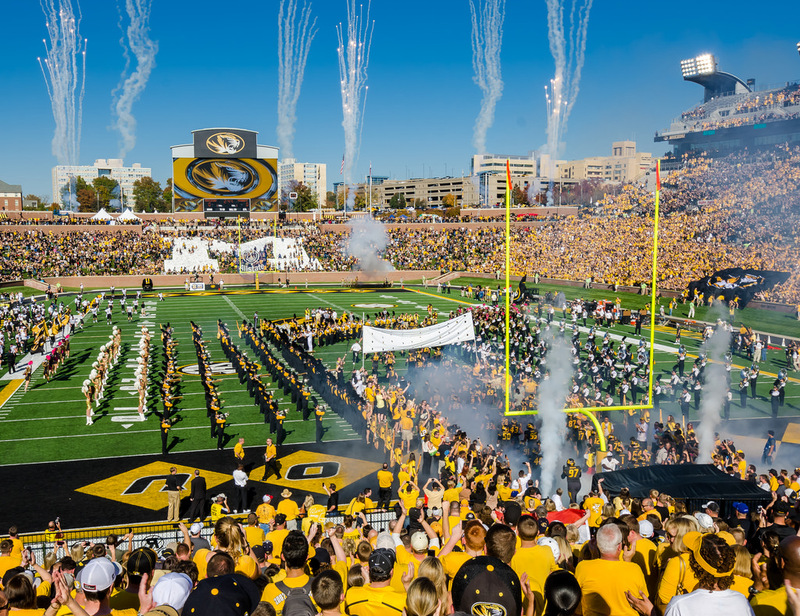 In August 2017 the University of Missouri approved construction of a $98 million football facility in the south endzone of Memorial Stadium. Construction of the project will begin in winter 2017 and be completed by the 2019 season. The project includes a three story, 200,000 square foot structure that replaced the general admission bowl, built in 1977. This facility will house a new locker room, training facilities, offices and meeting areas. It will also include 16 luxury suites, a 750 person field level club and just over 1,300 general admission seats. The seating capacity will be reduced to around 65,000.